Stellar Los Angeles Dodgers Cuban rookie sensation Yasiel Puig may have fallen ever so short of Joe DiMaggio’s all-time big league first-month base hits standard (46 for Hall of Famer DiMaggio in 1936 and 44 for Puig last month). But another sensational Cuban slugger has just equaled a unique standard for Mexican League base-hitting proficiency that had stood the test of time for nearly eight decades. 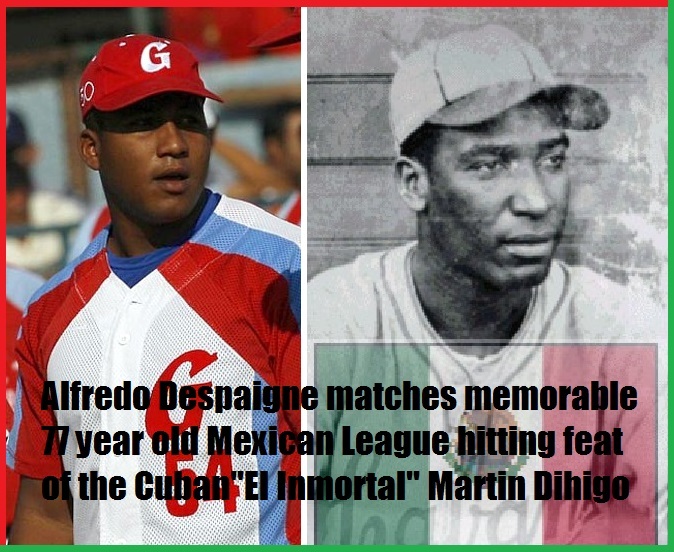 In brief, if Puig only shadowed DiMaggio, Despaigne has now caught up with four-hall-of-fame Cuban immortal Martin Dihigo. Wednesday night in Nelson Barrera Romellón Stadium the slugging outfielder (currently on loan from the Cuban Federation to the AAA league Campeche Pirates) banged out six straight base hits in as many at bats during a 10-4 victory over Saltillo’s Saraperos. On the night Despaigne singled five times (in the first, third, fourth, sixth and ninth) and capped the onslaught with a homer off Dominican veteran Willy Lebrón in the visiting team seventh frame. The six-for-six Mexican League milestone was first achieved by Cooperstown resident Dihigo on September 18, 1936 during a game between Aguila and Agrario played at Mexico City’s Delta Park. A full half century later (on march 28, 1989) the cherished record was equaled by native Mexican batting star Daniel Fernández Méndez during a contest between the hometown Mexico City Reds and rival Tabasco. Despaigne – a multiple-year Cuban League batting and home run champion – is currently coming off a season (National Series #52) in which he outdistanced José Miguel Fernández for the league hitting crown (.382 to .355). The Granma “Stallion” recently joined the Campeche club along with Granma teammate Yordanis Samón (the National Series number-three hitter at .354) and long-time Cuban national team third baseman Michel Enríquez. But Enríquez was discovered to have a nagging previous undiagnosed leg injury that slowed his defensive play, and Samon simply could not adjust to Mexican pitching; the result was that the pair was quickly released and shipped back to their Cuban homeland. So far Despaigne has obviously experienced no such disappointing setbacks. While there has been no official announcement of the Cuban squad slated to travel to the American Midwest and east coast in late July for a renewal of their series with the USA Baseball Collegiate all-stars, I have been able to uncover here in Rotterdam reliable information on the makeup of most of the traveling island ball club. The Cuban catching corps debuting on American soil July 18 in Des Moines will represent a complete change from the squad here at the World Port Tournament; the receiving duties will be handled by Lorenzo Quintana (Pinar del Río), Lednier Ricardo (Cienfuegos) and Lázaro Herrera (Matanzas). Nine pitchers will make the trip and seven are known at the moment. The group will be headlined by Ismel Jiménez (Cuba’s all-time career winning percentage leader) and Freddy Asiel Alvarez (Villa Clara) who is fresh off a record 40.2 consecutive scoreless innings hurled in last month’s National Series semifinal and final playoff rounds. Other hurlers will be Diosdani Castillo of Villa Clara (the league ERA pacesetter at 1.55), Noelvis Entenza (Cienfuegos 14-game winner currently here with Team Cuba at the Rotterdam World Port Tournament), Jonder Martínez (bullpen ace for Villa Clara during the recent playoffs), Villa Clara southpaw Misael Silverio (the only left-hander on the incomplete roster), and rookie of the year Norge Luis who divided his season between Camagüey (his assigned regular season team) and Sancti Spíritus (where he helped fuel a near-miss championship run as a “second half reinforcement” addition). Two further pitchers have yet to be revealed. Team Cuba’s starting infield on the American tour will be largely the same as the one now here in Rotterdam this week: José Dariel Abreu (Cienfuegos) at first; José Miguel Fernandez (Matanzas) at second, veteran slugger Yulieski Gourriel (Sancti Spíritus at third), and Erisbel Arruebarruena (Cienfuegos) manning shortstop. Additional infielders include Andy Sarduay (Villa Clara) and Yurisbel Graciel (Matanzas third baseman). But there will likely be at least one major change as home run king Abreu is currently suffering from a nagging rib cage injury and will most probably have to be pulled from action. The outfield, however, will boast a fresh appearance with Yasmani Tomás being the only World Baseball Classic and Rotterdam holdover. Newcomers to the Team Cuba outfield include Darion Varona (Villa Clara), Rusney Castillo (Ciego de Avila), and William Luis Campillo (Camagüey). Castillo is bouncing back from a sensational 2011 fall season in which he lead the entire field in batting during the Panama-based IBAF World Cup; William Luis moved from Camagüey to Cienfuegos this season as a second-half replacement player and tied Elephants teammate José Dariel Abreu for the league long-ball boasting rights with twenty. One additional holdover and also one new wrinkle in the World Port Tournament roster currently on display have also been quietly leaked. World Baseball Classic skipper Victor Mesa will replace Yovani Aragón in the manager’s seat while Juan de Dios (Sancti Spíritus) will continue to handle the pitching staff. A complete finalized roster (included ages and other personal data) will be available on www.BaseballdeCuba.com shortly.